Indigo Blue is related to the imaginative, intuitive aspects of our lives. Associated with the forehead or brow Chakra, the light rays emanating from indigo sources are said to promote intuition, self-realization, perception and psychic abilities. 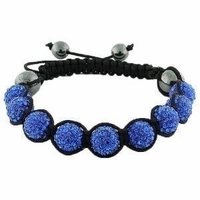 So if you want to increase your ability to live life on good hunches or to have confidence in the inner voice, then go ahead and wear lots of indigo in your Shamballa Bracelet.